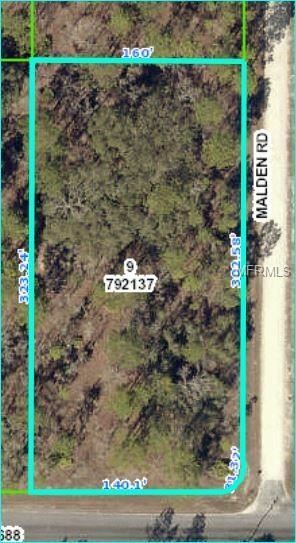 BEAUTIFUL 1.18 ACRE CORNER LOT JUST OFF THE MAIN PAVED ROAD OF THRASHER AND JUST MINUTES TO U.S. 19. THIS LOT WILL NOT LAST LONG ON THE MARKET. CLOSE TO ALL SHOPPING AND SCHOOLS. VERY COUNTRY LIKE AREA WITH ALL NEWER BUILDING TO THIS AREA. BUILD YOUR DREAM HOME ON THIS LOT. CLOSE TO 50 AND CORTEZ BLVD FOR THE BEST SHOPPING TO THIS AREA. US 19 NORTH RIGHT THRASHER TO LEFT MALDEN ROAD. CORNER LOT. The approximate monthly Principal & Interest payment for this property would be $111. This payment is based on a 30-year loan at a fixed rate of 4.12 % with a down payment of $2,150. Actual lender interest rates and loan programs may vary.